The Capitulative Breadth Indicator (CBI) spiked to 15 today. This is the highest reading it’s posted since I began tracking it live in 2005. Backtests to 1995 show only 3 other instances when the market was closing at new lows and the CBI was as high as 15. They occurred in August of 1998, September of 2001, and July of 2002. All three instances eventually shot up to mid-30’s or higher. The highest CBI reading was July 2002 at 52. Needles to say, we’re hitting some pretty elite levels here and those other selloffs were about as scary as they come. 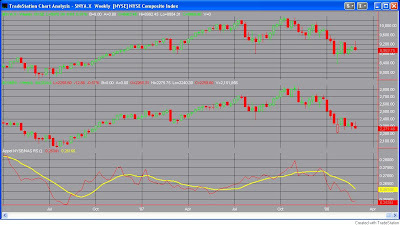 The 2001 and 2002 charts are posted in my Jan 22nd post “How Bad Can It Get?”. The 1998 chart is below. I’d suggest traders review their own charts of those periods as well to better formulate a game plan they’ll be comfortable executing. Those selloffs were incredibly scary. There was also incredible opportunity for short-term profit at those bottoms. The market is going to bounce. I believe it is going to bounce very sharply. It may sell off a significant amount price-wise before that bounce occurs. Time-wise I still believe we’re only days away from a multi-week bottom. I’m currently on the lookout for a washout day or a reversal day that could mark the low. Does Friday’s Drop In Fear Matter? The market continued to fall on Friday and the S&P 500 posted another new closing low. Several fear gauges showed less extreme readings than Thursday, though. Participants seemed to take the selloff in stride. For example, while still relatively high, the VXO, VIX, CBOE Total Put/Call and CBOE Equity Put/Call ratios all dropped. I ran some tests to see whether the lower fear levels occurring on a day where the S&P 500 made a substantial low indicated more selling was likely to come. For my tests I used the VXO. The conditions I layed out were 1) The S&P 500 must close at a “x” day closing low. 2) The VXO must close lower than yesterday. 3) The VXO must close at least 10% above its 10-period moving average. The study seemed to indicate that extended VXO levels – even if they were less extended than the day before, had a positive impact on returns over the next week or two. 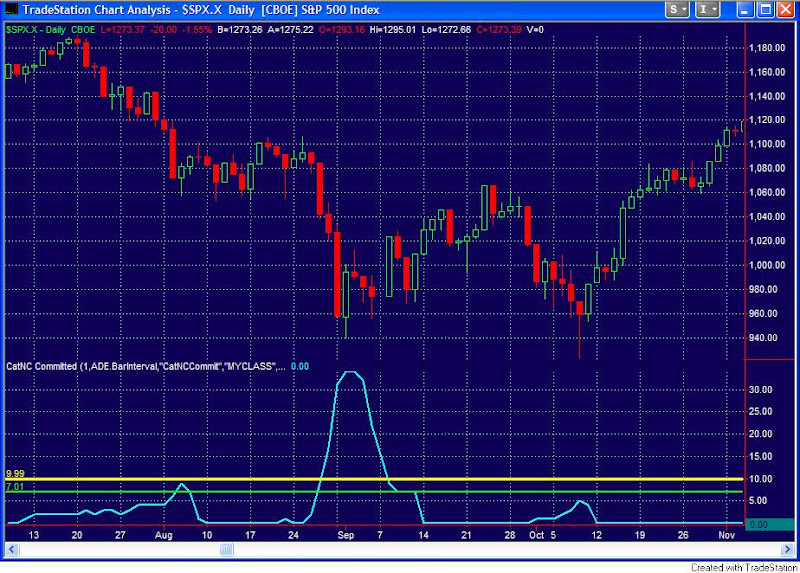 Below are the results when looking for a 20bar low in the SPX. The fact that the VXO is stretched appears to be more significant than the fact that it pulled back. Moving the bar out to a 100 bar low for the SPX gave these results. In short, Friday’s slightly reduced VXO levels don’t seem to have any negative connotations. Traderfeed – An interesting study and indicator to add to your p/c charts. Daily Options Report – Some thoughtful musings on p/c related to volatility. 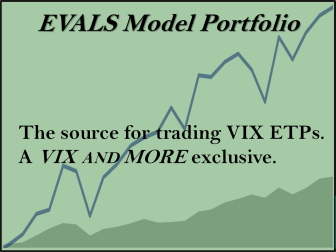 VIX and More – A long term view of the equity p/c ratio. My Capitulative Breadth Indicator (CBI) moved up to 11 on Friday. In the past, readings above 10 have signified broad capitulative action in individual large-cap components. It has been a reliable indicator of exhaustive movement and has frequently been followed by a substantial short-term bounce in the S&P 500. Readings above 10 have been a fairly rare occurrence with only 16 instances in 13 years between 1995 and 2007. They’ve become more frequent recently, though. This is the third time the indicator has moved to 10 or higher in the last 5 months. As I’ve written in the past, buying the S&P 500 on a close in the CBI of 10 or higher and then selling when the indicator closes back at 3 or lower would have been profitable 100% of the time. The indicator is currently 17 for 17. This does not mean it will work this time. It also does not mean there won’t be significant downside before the expected bounce ensues. In a post on January 22nd, “CBI Spiking – How Bad Can It Get?” I looked at the two worst selloffs from a percentage standpoint that occurred after a 10+ CBI reading. I’d suggest reviewing it. I ran a scan tonight to see what the longest period of time was before a bounce ensued under the following conditions: 1) The SPX is trading at a 50-day low. 2) The CBI moves up to 10 or higher. Seven of the past 17 CBI spikes have occurred when then SPX is at least at a 50-day low. Of these seven times, the longest the market has continued to drop before beginning a substantial bounce was 3 ½ days. The lowest close was 3 days later. The lowest low was 4 days later. Interestingly, these were the July 2002 and September 2001 instances listed in the “How Bad Can It Get?” study. While the market could fall substantially over the next few days, the CBI is suggesting a multi-week low should be made by the end of the week. What’s amazing about today is that it is the 2nd day in a row we’ve had this same formation. I ran a test to see how the market has reacted to back to back reversal bars like this in the past and came up empty. This was the first time it has occurred for the SPY. It has never occurred for the NDX. The above reversal bar on its own has shown a mildly bullish tendency. We’ll see if the market can muster anything more than a late-day rumor-inspired pop. The CBI hit “5” today. This is the first level that I consider significant. Since 1995, buying the S&P 500 when the CBI closed at “5” or higher and selling when it was back to “3” would have results in 77% winning trades and gross profits outsizing gross losses by over 5:1. I generally don’t buy at this level but rather cease taking on new short positions. The cluster that is forming could easily rise to “7” or “10” in the next day or so if the market continues to drop. At those levels I may consider index longs. The market was shorted if the above conditions were met and covered X weeks later. $100,000 per trade. The results – listed below – changed very little. When the NYSE is hitting new short-term highs while the Nasdaq is lagging badly, it normally means the NYSE will succumb to the will of the Nasdaq. Like the original study, the expectation over the next 1-10 weeks is negative. I checked to see how the S&P 500 has reacted past times it finished down 4 months in a row. Going back to 1960 there have been 10 other occurrences with exactly 4 down months in a row. Of those 10 times, 5 finished higher the following month and 5 finished lower. The average winning month was 3% and the average losing month was 2.5%. Looking at any time the market has closed lower 4 or more times, I found 21 occurrences. Ten finished the next month higher and eleven finished it lower. Average gain was 5.1% and average loss 4.5%. The longest losing streak was in 1974 when the S&P 500 finished lower 9 months in a row. Looking at consecutive lows on a monthly chart does not seem to provide any quantifiable edge. 1st Trading Day of the Month – Is There A Bias? Over the weekend I got an email from “Brian” – a regular reader. He wrote that he had read one time that when the S&P 500 closes down 1% or more on the last trading day of the month, the next day has had a strong positive bias. He went on to note that eight of the last ten times this has happened the month has started with an up day. I’ve read other research in the past suggesting that the 1st day of the month had a strong seasonal bias and I decided this whole notion was worth exploring more. Brian’s 8 for the last 10 result matched my data, and in fact the 1st day of the month has been positive 11 of the last 13 times going back to November of 1998. Looking back further, though, there was no apparent edge. Between 1960 and November of 1998 there was a 1%+ drop on the last day of the month 25 times. Thirteen times the market lost ground the next day and twelve times it gained. Since 1960 there has been a 55% chance of the 1st day of the month then having an up-day. When you consider that the chance of ANY day over that period being an up day was about 53%, the edge doesn’t seem large. I broke out the data looking at 1960-1995 and then 1996-present and found some interesting differences. From 1960-1995 the chance of a down last day being followed by an up first day was only 47%. Since the end of 1995, it has happened 74 times with 54, or 73% of them, showing a gain on the 1st day of the next month. Looking at all 1st days of the month shows a similar picture. From 1960 through 1995 the 1st day of the month finished positive 53% of the time – perfectly in line with all days. Since 1996 the first day of the month has finished positive 66% of the time. Studies of recent history would show an upside bias on the 1st day of the month. Long-term studies would not indicate a bias. I cannot explain what may have happened in the 90’s that would have caused this to occur. Therefore it is difficult for me to say whether the bias truly has changed or what might cause the bias to revert back to pre-’96 form. Traders that try and incorporate the so-called “1st day of month bias” into their trading should be aware that the bias did not always exist, and therefore at some point may cease to exist again. Are IBD Follow Through Days After Day 10 Less Reliable? One of the interesting claims that William O’Neil make about Follow Through Days is that they are less likely to work if they come more than 10 days from the potential market bottom. As part of the study on Follow through Days, I decided to test this. Those who missed the first several installments of this study may want to click on the “IBD Follow Through Day” label lower down on the right hand side of the page. This will be the 9th installment in the series. Using the original basic assumptions of an 8% decline needed and a 1% up move on the Follow Through Day (as opposed to the current 1.7% requirement that I found to be less effective), I reviewed all FTD’s listed in the study. A Follow Through Day actually occurring after day 10 was a fairly unusual occurrence. Downtrends and bottom formations typically carry significant volatility, so a strong, high-volume move off a low normally occurs before day 10. Seven of the eight FTD’s that came after day 10 were successful according the study. While the sample size may be too small to claim significance, there certainly seems to be no credence to the claim that FTD’s after Day 10 are LESS reliable. In fact, the opposite appears true. Seven out of eight seems especially impressive considering the fact that only 55% of the FTD’s in the study were successful. I suspect one reason for this may be that the delayed FTD allows stocks more time to carve out proper basing formations before the market attempts to launch higher. In light of the facts, it seems a curious claim for IBD to make. The takeaway here is: next time a follow through day doesn’t come immediately, traders shouldn’t fret. The chance of success is likely higher. After my VIX post a couple of days ago, “Frank” made some interesting comments in the comment section. He duplicated part of the system I discussed, but his results were very different. Using a 15% VIX stretch (a close 15% above the 10ma) he found 17 of 18 short trades since 2004 to be winners if you wait for a reversion to the 10ma to exit. The big differences sparked some good conversation over at the Daily Options Report, which has picked up on this study. So I felt I should clear up a few things. 1) I mistyped in my post. Options were not used in my testing – futures were. 2) My “system” looked at several measures of overbought/oversold – it generally entered if more than one triggered and exited when the triggers were removed. The 15% VIX stretch was one example. 3) I did not scale in. If a trigger occurred, the system was basically “all in”. I’m sure scaling as Frank did, would help. 4) I don’t think 1, 2, or 3 above really matter much. Looking back to the beginning of 2004 I did a quick count of the number of days that the VIX closed at least 15% above its 10ma. I counted about 70 times. Frank only found 18 times. I suspect Frank was looking for a 15% stretch in the futures. I was looking for a 15% stretch in the actual VIX. My point was to show that the futures and options could not be easily traded based on the action of the VIX alone. A stretch in the futures successfully reverting to its mean doesn’t surprise me. I’ll bet in many of those 18 cases the VIX index would have put the system into the trade even earlier and at a worse price – turning several of Frank’s winners into losers. To sum up – the VIX is not tradable. Buying calls or puts based on VIX action as I’ve seen suggested in the media looks good on the surface but is a horrible strategy. Frank has generously shown that astute traders CAN successfully trade VIX futures by focusing on VIX futures action. 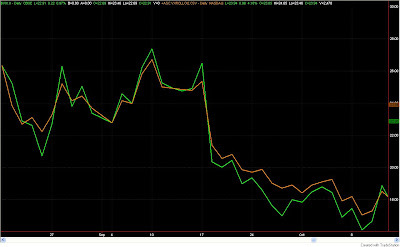 Below is a chart of the VIX(green) and front month VIX futures (orange). The chart is a few months old because I don’t have my futures data fully updated (I don’t trade it). The takeaway from this chart is that sharp moves in the VIX “cash” index are dulled in the futures. Note how while they generally move in the same direction, the cash VIX will oscillate around the futures. If you look at futures further out than front month, this “dulling” of the VIX moves by the futures will be even more pronounced. Do Reliable Oscillations In The VIX Make VIX Options An Easy Profit Vehicle? I’ve seen some articles in the press over the last few months suggesting that one way to profit in volatile markets is by trading VIX options. They typically make it sound easy. “You don’t even need to know the direction of the market. You just need to determine whether volatility is likely to rise or fall. If you think volatility is going higher, you can buy VIX call options. If you think its going lower you can buy VIX put options.” The problem with this logic is that VIX option prices do not follow the VIX index. They follow VIX futures prices. A couple of months ago I decided to quantify how much this really matters. 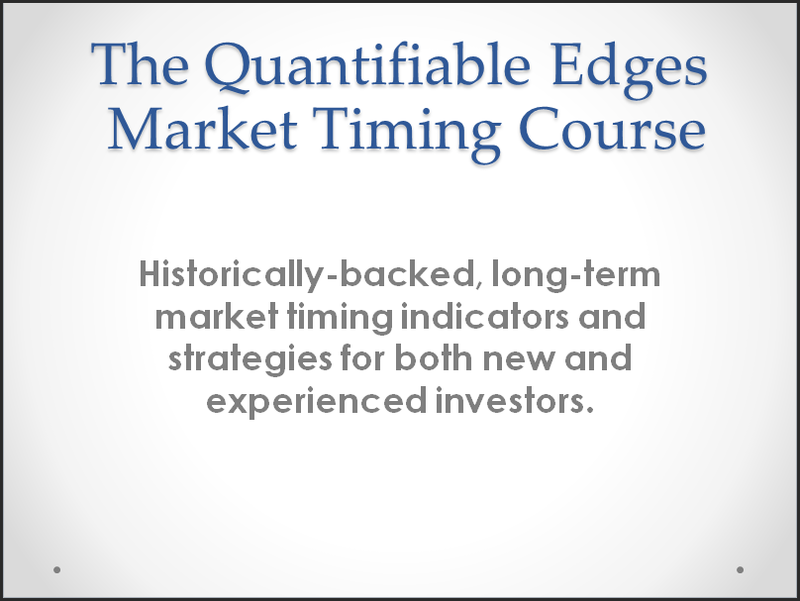 It is well known by traders that the VIX has a strong tendency to oscillate. Therefore, when people consider trading the VIX, they many times think mean-reverting strategies will work best. I took some simple mean-reverting strategies and applied them to the index to see what kind of returns I would get. 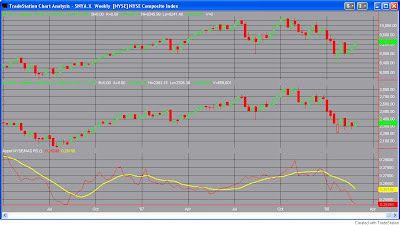 Two examples were: 1) Short the VIX if it closes 15% or more above its 10-day moving average. Cover when it closes below its 10-day moving average. 2) Short the VIX if it closes at a 10-day high. Cover when it closes below its 10-day moving average. In both cases the opposite stretch would apply for purchases. Not surprisingly, they worked. What was intriguing was HOW WELL they worked. I then combined these strategies with a few others to create an indicator which would signal to me when the VIX was stretched and due for a reversal. Assuming you treated the VIX as a security and allocated a certain dollar amount whenever you bought/shorted it, over the last 3 years my simple system would have returned about 170% per year based on raw returns (no commissions or slippage). Now, to see the effect that trading futures would have on the system, I downloaded all the historical data from CBOE and ran the trades through using front month options. I performed rollovers those times when the future expired before the trade closed. Note that the entry and exit triggers were based on the action in the VIX – not in the futures. 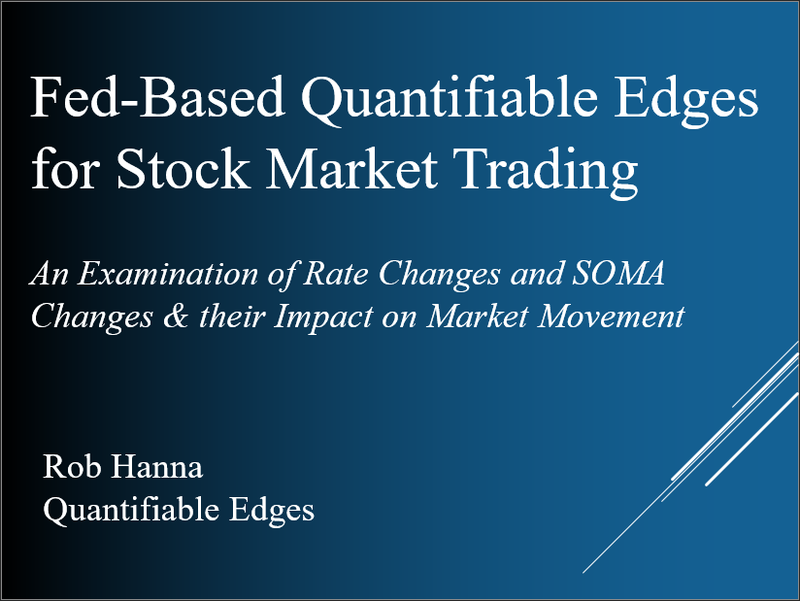 The purpose of the study was to see whether someone could trade futures/options based on the action in the VIX index. The results? Instead of returning 170%/yr over the last 3 years, the system now returned 5% total!! Factor in some commissions and slippage and my incredible system is now a money-loser. Moral of the story: Be careful when trading VIX options / futures. Simple systems which look spectacular on the VIX cash index simply do not translate. Below are some informative links which also discuss this issue. Surge Leads To Breakout – Is That Good? More bailout talk today led to another surge of buying. The major averages closed strongly positive on good breadth and increased volume. Technically notable is the fact that the triangle pattern in the S&P was broken to the upside. An argument could be made that the triangle broke to the downside on Friday and that break quickly led to an upside reversal. Based on the definitions in the studies I laid out last week, there was no break on Friday. The first breakout came today. In this case I’ll stick with my definitions because those are the ones that were used to develop the statistics. The minimum target based on those studies’ triangle measurements would be 1446.57. Of note is that over 70% of these patterns have failed to reach their target before dropping below the lower triangle line. In this case a failure would mean a move below 1327.04. It appears looking for an entry to fade this breakout may provide the greatest edge. The surge the last two days which broke this market out has certainly been impressive. I looked back to see how the market had reacted following similar boughts of strong buying. Below is a table displaying how the market has performed near-term following two strong days of buying during a long-term downtrend. Historically, fading these surges has provided a decent edge. As can be seen in the picture above, not all breakouts are good news. Between the 2-day surge and the triangle breakout study it appears the edge over the next few days is to the downside. While the move down Friday morning may have violated trendlines some technicians drew on their charts, it did not signal a break for either of the triangle testing methods I laid out last week. For violations to be official I currently would need to see one of the following: 1316.75 broken on the downside for method #1, 1369.23 on the upside for method #1, or 1367.94 to the upside or 1327.04 to the downside for method #2. Therefore, as per the studies, we are still waiting for a break to look to fade. The studies on Thursday night suggested fading the breakout could be the highest-odds play. While it failed to move the S&P 500 out of its range, the action Friday certainly wasn’t mundane. A late-day reversal led to a sizable upside surge – moving the indices from squarely negative to squarely positive. I decided to look and see whether past late-day surges had led to a directional edge over the days following. Looking back 30 years I was only able to find 22 other times where the S&P 500 gained over 1.5% in the last hour of trading. Results following those instances were mixed. Over the next one and two days the market closed higher 10 of 22 times. Over 3 and 5 day periods the market increased 14 times. Looking our further (10, 15, 20 days) results were close to a coin flip. The win/loss ratio in all these instances was close to 1 as well. In other words – the late day surge on Friday seems to have no predictive value when looking out over the next few days. All it managed to do was put the market squarely back in the middle of its range. Traders with time-frames longer than intraday may want to continue to wait for a range resolution before getting aggressive.